Two of the best indie developers around are teaming up to form an even bigger, better studio. Firemint and Infinite Interactive have some well-deserved reputations for quality indie games across just about every platform. The two developers have made some of the best-reviewed games across just about every major platform including iPhone, PC, 360, PS3, PSP, DS and Wii. 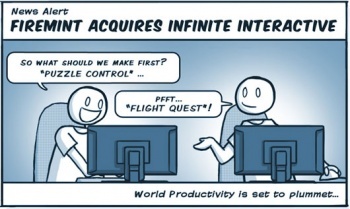 Now, they're joining forces, as it turns out that Firemint has purchased Infinite Interactive. The companies are combining to form an even bigger/more effective independent developer that will "[work] exclusively on self-published original games." It turns out that the two groups have been thinking about such a merger for a while. According to Firemint's Rob Murray, "[Infinite Interactive founder Steve Fawkner] and I have been talking about working together for a long time, and I remember him showing me an early version of Puzzle Quest. This inspired me to make a game during my own holidays two years later, which was Flight Control -- and now, another two years later, we've finally found a way to work together!" The developers are both based out of Australia, and Infinite is expected to merge into Firemint's recently expanded Melbourne offices. Sounds like PopCap might be facing some major competition in the near future.